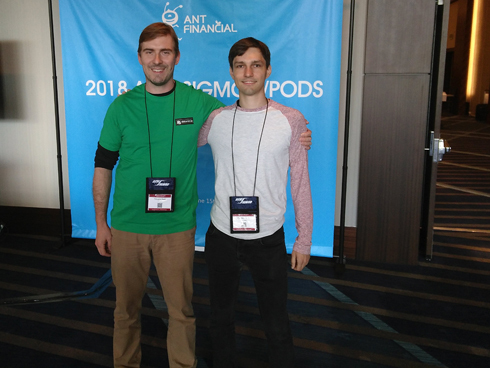 Prof. Dr. Tilmann Rabl, Dr. Sebastian Schelter, and Clemens Lutz from TU Berlin’s Database Systems and Information Management (DIMA) Group recently presented their research at SIGMOD 2018 (the 2018 International Conference on Management of Data), which was held in Houston, TX, USA, on June 10th - June 15th, 2018. DIMA contributions included presenting a full paper, a workshop paper and organizing two workshops. 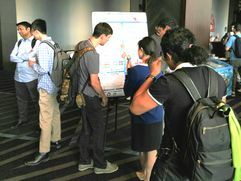 This year's SIGMOD featured 90 research papers, 15 industrial papers, 2 invited industrial papers, 35 demonstration papers, and 12 co-located workshops. Keynote talks were held by Prof. Dr. Eric Brewer, VP of Infrastructure at Google, and Prof. Dr. Pedro Domingos, professor at the University of Washington. The first keynote introduces and explained the core concepts behind Kubernetes, a technology to manage container-based applications in the cloud. 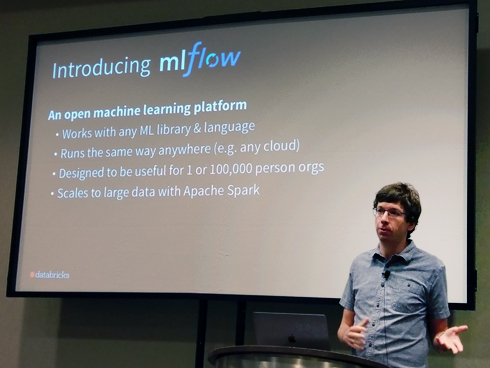 The second keynote outlined how current machine learning models are based on theoretical assumptions (i.i.d.) that may not hold in practise, and gave an outlook on ML models without these assumptions. Kraska et al., "The Case for Learned Index Structures"
Idreos et al., "The Data Calculator: Data Structure Design and Cost Synthesis from First Principles and Learned Cost Models"
Kissinger et al., "Adaptive Energy-Control for In-Memory Database Systems"
In the first paper, Kraska et al. replace traditional index structures, such as B-Trees, with trained ML models. Idreos et al. show that many more data structures are yet to be discovered, and find a systematic way to discover and describe them in the second paper. In contrast, in the third paper, Kissinger et al. highlight the importance of energy-efficiency in databases queries, and dynamically control the processor to reduce energy consumption. At the DaMoN workshop, Andy Rudoff, Principal Engineer at Intel, held the keynote on NVRAM. His presentation demonstrated new tools to integrate NVRAM into operating systems and databases. 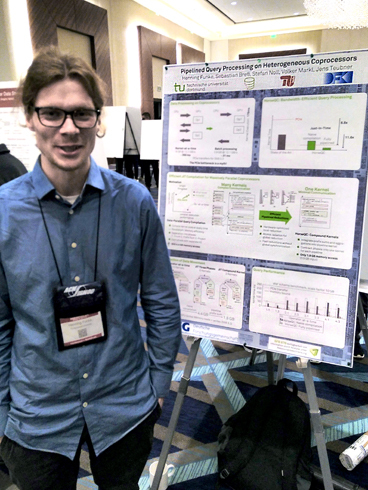 Doctoral student Henning Funke at TU Dortmund, who worked in collaboration with Dr. Sebastian Breß of the DIMA Group, presented his full research paper “Pipelined Query Processing in Coprocessor Environments”. The paper analyses the data movement of query coprocessing in existing database systems and shows ways to improve the processing efficiency using Just-in-Time compilation. This research was joint work conducted with the DBIS Group of Prof. Dr. Jens Teubner at TU Dortmund. Henning Funke Sebastian Breß Stefan Noll Volker Markl Jens Teubner (2018). 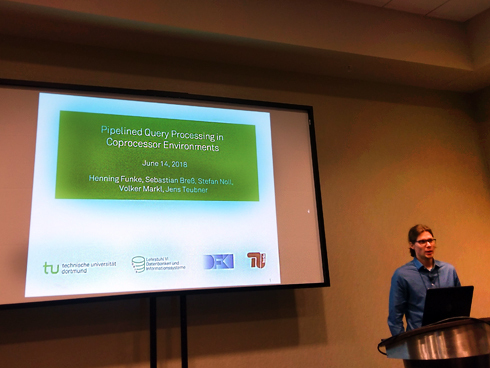 Pipelined Query Processing in Coprocessor Environments. In International Conference on Management of Data (SIGMOD). ACM. 2018. PhD student Clemens Lutz presented his paper on "Efficient k-Means on GPUs" at the Data Management on New Hardware (DaMoN) workshop, held with ACM SIGMOD/PODS 2018. 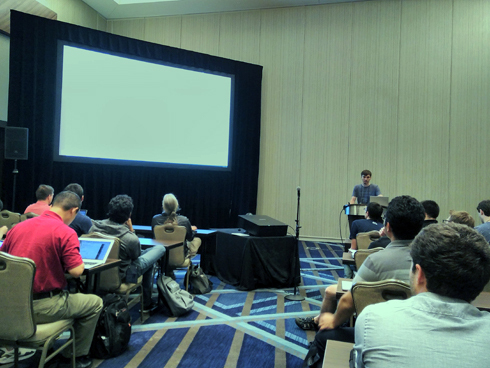 In his talk, he presented a new approach to executing k-Means in a single data pass per iteration on GPUs. The work identifies two shortcomings of existing strategies, involving unnecessary data transfers from the GPU and inefficient use of memory bandwidth. He proposed to solve these problems by redesigning the k-means algorithm to taking advantage of architectural properties specific to GPUs. CL-kmeans is available on GitHub. Clemens Lutz, Sebastian Breß, Tilmann Rabl, Steffen Zeuch, Volker Markl (2018). Efficient k-means on GPUs. Proceedings of the 14th International Workshop on Data Management on New Hardware (DAMON '18), 3:1 - 3:3.